Scientists have, for the first time, mapped the cloud cover of a planet beyond our solar system. The distant world, known as Kepler-7b, has high altitude cloud cover in its western hemisphere and generally clear skies in its eastern hemisphere. Kepler-7b’s clouds were discerned by using the Kepler and Spitzer Space Telescopes. 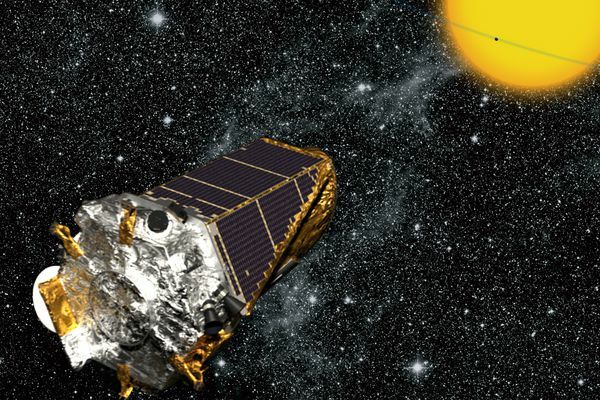 For three years astronomers used Kepler to gather data on the light reflected by the planet. Meanwhile, Spitzer’s capability of observing infrared radiation from a celestial object allowed the researchers to pinpoint a temperature range for the planet. It is not cool on Kepler-7b. Data indicates that the planet has a temperature of between 1,500 and 1,800 degrees Fahrenheit. Considering that Kepler-7b is quite close to its sun – only about 0.06 astronomical units (Earth is one AU from our sun) – it is actually surprising that the planet is not hotter than it is. That temperature range is too low to be the source of the light detected by Kepler. Astronomers therefore concluded that high-altitude clouds must be reflecting radiation from the system’s star into space. Kepler-7b is a gas giant and has a radius about one and one-half times that of Jupiter. It is the largest of the six known planets in its system. The Kepler Space Telescope’s mission ended earlier this year when a wheel integral to its operations failed. Researchers at NASA, Massachusetts Institute of Technology, California Institute of Technology, and other universities will publish a technical paper about the discovery in Astrophysical Journal Letters. 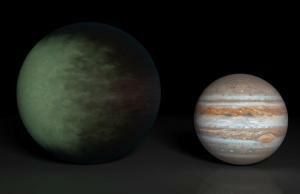 Graphic comparing Kepler-7b to Jupiter courtesy NASA, Jet Propulsion Laboratory-California Institute of Technology, Massachusetts Institute of Technology.